CONGRATULATIONS TO THE 2012 AGWT SCHOLARSHIP RECIPIENTS! 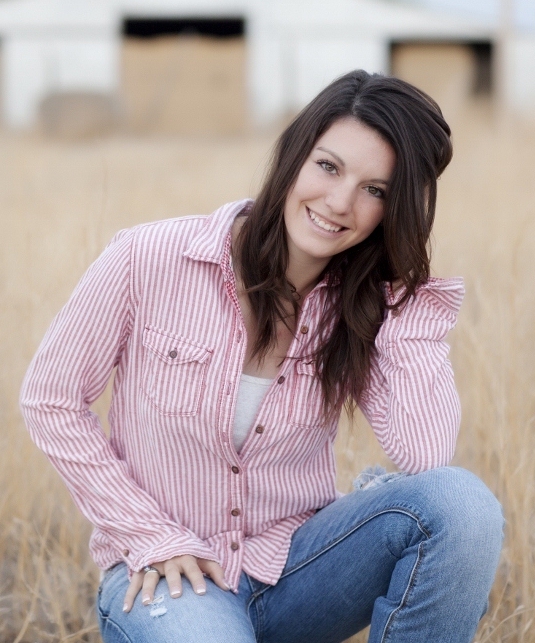 Ms. TyLynn Payne grew up in the Pecos Valley experiencing first-hand the critical relationship between water resources and livelihoods based on agriculture. Her goal is to create a career educating communities from a foundation of science and law about water conservation and how water usage affects local industries. 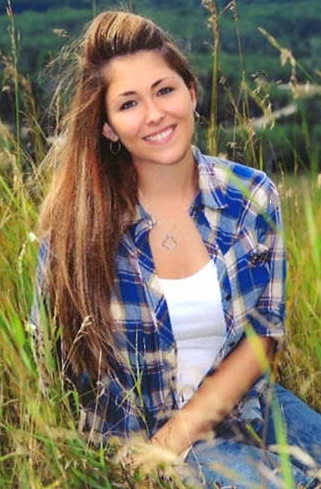 Having graduated as the Valedictorian of her class at Dexter Consolidated Schools, TyLynn will begin four years of study at Tarleton State University in Stephenville, Texas this fall leading to a degree in Environmental Science. Levi’s goal is to develop a career in which he can wake up every day and work to improve human-environmental relationships. Mr. Warring will begin this journey as a First Year at Washington and Lee University this fall pursuing a major in Environmental Studies. During his Senior year at Lafayette High School he did research on the groundwater quality beneath the historic Jamestown colony and its correlation with the land use activities and incidents of disease that decimated the colony’s early population. When he is not studying groundwater quality Levi can be found running cross country or competing in track and field events with equal success having placed second overall in 4x800 meter relay in the Virginia High School League AA Outdoor State Championships. Brennan Peterson Wood graduated from Sacramento Waldorf School in the top five percent of his class with a nearly perfect GPA. He will attend Colorado College this fall pursuing a degree in Environmental Science with a particular interest in water resources. Brennan loves the outdoors and during high school worked on several water quality studies and education projects in the Stanislaus National Forest and his local community. He hopes to pursue a career that will improve water resource management through collaboration and the application of practical science. ~ What North Carolina can learn from shale-gas development in other states. ~ How public understanding of the technology is framing NC opinion and policy. ~ What the economic and environmental impact could be if shale-gas potential is fully developed in NC. The program provided a balanced information-exchange opportunity among the energy industry, the water industry and citizens and communities with an interest in the economic potential of shale-gas development and the long-term environmental sustainability of water sources and water-dependent ecosystems. E ighth-grade scholars from Rocky Run Middle School, Virginia attended The AGWT June program on geothermal heating and cooling applications. The students recently completed a science project (Project Radient) that was a demonstration of how geothermal heat pumps work. Their work gained them the status of eCybermission’s Northeast United States Region Eighth Grade Champions. eCybermission is a US Army web-based Science, Technology, Engineering and Mathematics competition for 6th, 7th, 8th and 9th grade teams. 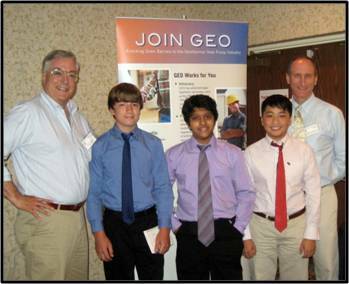 Pictured here are Jasper Treakle, Raghav Ramraj and Matthew Sun (center three students),Garret Graaskamp (Right), Director of Programs for the American Ground Water Trust, and Ted Clutter (Left), national forum sponsor of AGWT Geothermal Forums and Manager of Communications and Outreach for Geothermal Exchange Organization. The students attended the AGWT Forum at the suggestion of Scott Emery, Senior Project Manager, Bowman Geothermal, Manassas, VA who was a presenter at the Forum and was the principal technical mentor for the students’ project. This road-side message in California’s Central Valley near Fresno is a clear statement about the crucial role of irrigation water to ensure the nation’s food supply! At a Fresno conference in March which had a specific focus on irrigation, the American Ground Water Trust convened the Groundwater Session. The conference was organized by the International Center for Water Technology and was held in Fresno, CA. A Biotechnology Approach for Low Cost Nitrate Degradation in Water. Details of all the conference presentations are listed at http://icwt.net/wtc/index.htm . 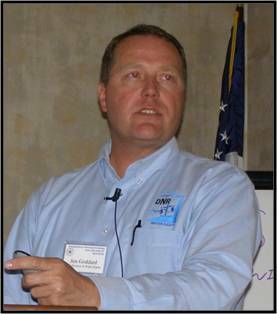 Jim Goddard, Well Program Manager, Utah Division of Water Rights, Salt Lake City, UT, was a presenter at the one-day program in SLC on geothermal technology. The SLC event was one of ten such events scheduled around the country this year by the American Ground Water Trust. Ground source heating and cooling is recognized by the EPA as “the most energy-efficient, environmentally clean, and cost-effective space-conditioning system”. The AGWT supports geothermal technology and our education programs emphasize the importance of correct design and installation practices. Geothermal loops use the constant sub-surface ground temperatures as a heat source during the winter and a heat sink during the summer. Heat pumps draw thermal energy from the ground during the winter to heat buildings, and reject heat from buildings back into the ground in summer. Recharging aquifers with water at times of surplus that can be pumped out for later use when other supplies are scarce is a long established technology. 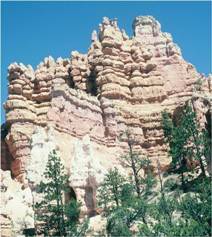 Most aquifer recharge systems are designed for municipal water use. Increasingly attention is being given to the potential for using recharged water for agricultural use. Pictured at a recent workshop in Canberra Australia that focused on the potential role for Managed Aquifer storage (MAR) in agriculture, are Bryce Kelly (University of New South Wales, Sydney), Andrew Stone (American Ground Water Trust), Allan Curtis (Charles Sturt University, Albury), Tony Jakeman (Australian National University, Canberra). 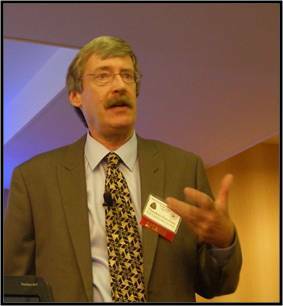 Stone was invited to attend the event to provide a perspective on aquifer recharge projects in the US. AGWT staffer Brianna (pictured in our display booth) attended the annual New England gathering of contractors, suppliers and manufacturers from the water well industry. On-site water wells for homes are of great importance in the northeast as are groundwater based water supply systems for thousands of communities and towns. The annual NEWWA meeting provides a great opportunity for contractors to find out the latest product informatioin from water system and water well equipment manufacturers and to attend workshops and training seminars. The AGWT presenterd a seminar on “fracking” that explained the important differences between the hydrofracture of water wells and the hydraulicfracture process used by the shale-gas industry. With potential shale-gas basins now identified in central Massachusetts maybe it won’t be too long before the energy industry takes an interest in exploring for New England’s shale-gas? 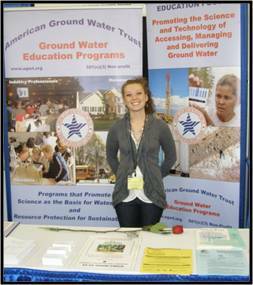 The American Ground Water Trust was invited to participate in groundwater meetings in Denmark. 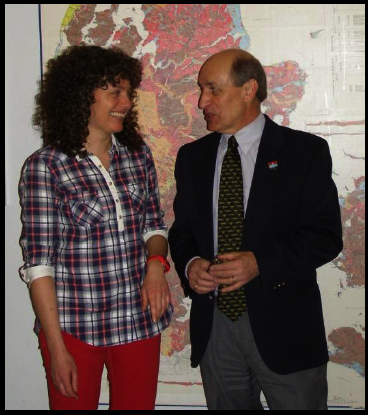 The picture shows Andrew Stone, Executive Director, American Ground Water Trust and Heidi Barlebo, Head of Department of Hydrology, Geological Survey of Geological Survey of Denmark & Greenland (GEUS) in conversation after Stone’s presentation on “Enhancing capacity of decision makers for groundwater development, use, protection and management.” at GEUS Headquarters in Copenhagen. Stone was also a guest speaker at a program held in Vingsted, central Denmark, “Groundwater for Growth, Development and Climate Change Adaptation.” The Vingsted program was organized by the Danish Chapter of the International Association of Hydrogeologists. The American Ground Water Trust and the American Institute of Professional Geologists organized a two-day conference program in Austin, Texas that brought together energy industry, water experts, environmental groups and regulatory authorities to discuss the economic potential of shale gas development and the long-term environmental sustainability of water sources in Texas. 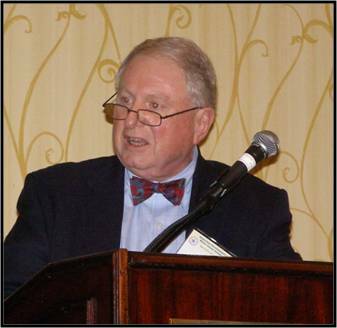 Robert Traylor, a petroleum geologist and a geological advisor on groundwater protection for the Railroad Commission on oil & gas operations was one of the presenters. He spoke about the importance of understanding the geological characteristics needed to ensure the safety of the disposal of brines and flow-back fluids resulting from hydraulic fracturing operations.